A letter from Peter C. H. Pritchard (b. 1943) to Gary I. Sharp, dated June 3, 1975. 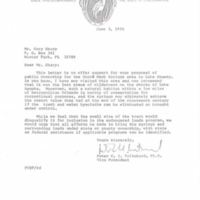 In this letter, Dr. Pritchard, Vice President of the Florida Audubon Society, writes in support of Sharp's proposal that the Gourd Neck Springs area of Lake Apopka be acquired for use as a public park. Dr. Pritchard states that the area is too small for purchase under the State of Florida's Environmentally Endangered Lands (EEL) program, but that the area has environmental value and would be worth acquiring by the public. 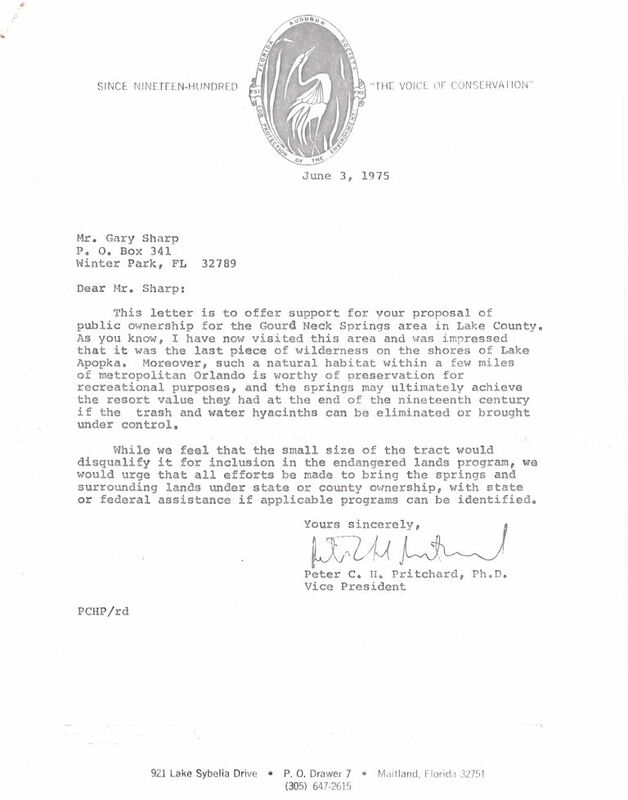 Photocopy of original 1-page typewritten letter from Peter C. H. Pritchard to Gary I. Sharp, June 3, 1975: binder 1975, Friends of Lake Apopka Archives, Ginn Museum, Oakland Nature Preserve, Oakland, Florida. Digital reproduction of photocopied 1-page typewritten letter from Peter C. H. Pritchard to Gary I. Sharp, June 3, 1975. Originally created by Peter C. H. Pritchard. Pritchard, Peter C. H.. “Letter from Peter C. H. Pritchard to Gary I. Sharp (June 3, 1975).” RICHES of Central Florida accessed April 20, 2019, https://richesmi.cah.ucf.edu/omeka/items/show/7833.